I don't have a number to report today, because today is Day 7 of my 30 day "no weigh" scale-free challenge. And let me tell you - it's a challenge, alright. 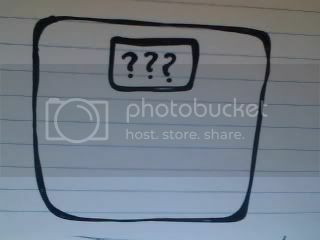 It's weird: for the first time in 272 days, I don't know exactly what I weigh. And that's surprisingly tough. My scale dependency has definitely improved from when I first started losing weight back in August - I would weigh myself upwards of five times a day, mostly because I was in awe of the results. (Go figure ... you move more, eat less, and eat better, and the numbers drop.) Eventually I got it down to once a day, which is still a lot, but certainly an improvement. I've been trying to focus on other things this week. Wrapping up my last week of teaching, processing my thoughts on last week, eating light and clean, and really enjoying my workouts. I'm feeling good, and I know I am doing well even if I don't have a number to define that success. Well, I have one number. As in, the size jeans I just bought. They're a little tight. They muffin top like nobody's business. But they zip and snap, and that is a wonderful thing - my 14s are pretty loose, and my work pants a year ago were 28s! What about you? What non-scale successes are you celebrating this week? That's awesome!! My NSV is the fact that my workout pants are getting too big!! So big in fact, I'll need to purchase new ones! A size 12!? Holy freaking cow!! I can't wait until that day. I will probably lay down in the dressing room floor and cry. I don't ever remember being a 12. I do remember being a size 13 in the 6th grade. That was the last year I shopped in the "junior" department. I know I tell you this all the time but you are truly an inspiration! One year ago I was wearing 22's, now my 14's are to big but 12's, well not quite yet. YEAH!!!! for you. That is awesome. Keep up the great work. Good luck on the no weigh in's. When I first started losing weight I only weighed in once a month, then it because twice a month, now once a week but starting in June I'm going back to just once a month. It's almost maintance time and I don't want to fret day to day on what the scale says. P.S. NSV, laundry...I posted a post this week about it. Check it out if you'd like. I think my left leg would be a size 12 :-) Congratulations. I am wearing some jeans now that I couldn't zip not too long ago. Workouts are going well. I have a better attitude. Life is good. My non scale essentials? I finally hit a size 16 dress. I just found out I'm pregnant. Congrats on the size 12's - that's amazing! And good for you for being able to stay off that scale - I know that has to be really hard! BTW - I have an award for you on my blog! YAHOOOOOO!!! Congrats on the NSV. You are AWESOME!!! I posted 5 NSVs the other day. I try to do it on thursday so if my weigh in is not the greatest I can look back 1 day and be happy at what I did see change. I went and tried Pilates on Wednesday. I am putting on makeup again and wearing jewelry. :) Also I signed up for the Step Out Walk to Stop Diabetes which is June 4th in my city. I hope you have a great weekend! The drawing of the scale is so cute. Congrats on buying a size 12! What size are you hoping to go down to? I had to buy a medium belt instead of an X-Large :) That's mine. What an awesome NSV. Sometimes we focus on the scale too much. You are doing great! Some of my NSV will be that on Friday I went on a 3 mile hike. ME! That's incredible especially since 6 months ago I could barely walk a mile without being out of breath and having back pains. I also dropped an x from my clothing size. yay!